Soci has unveiled a stylish new Mini Picket pattern for its popular glass mosaic Studio series. Beautifully designed to emulate the peaks of a picket fence, Soci’s Mini Picket creates a contemporary and modern flair well suited for residential and commercial spaces. Mini Picket is offered in three new on-trend color blends Birch, Glamour and Graphite, which range from champagne to light gray to black. Available in three color blends, Glamour, Birch and Graphite, Soci’s Mini Picket pattern is a fresh new take on the popular picket tile design, made smaller with a mini 3″ version. Offered in mesh-backed 11.22 X 11.61 sheets, the tile is suitable for interior walls, floors, wet areas and covered exterior areas. Glamour’s color blend brings distinction to traditional and modern rooms from kitchens to baths with a subtle champagne hue and a combination of shimmer and solid colors, to give a textured appearance. 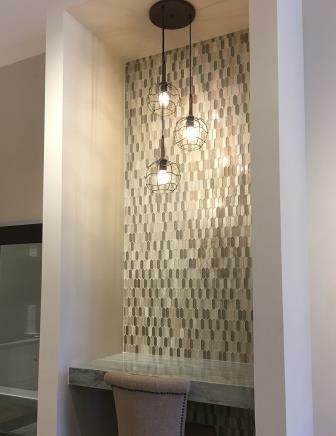 Birch consists of a warm blend of Marquette Marble and glass with beige, taupe and light gray hues creating a pleasant and inviting aesthetic to any space. Graphite’s blend infuses a contemporary combination of stone and glass for a bold and masculine feel. 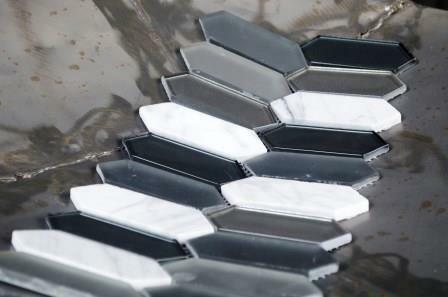 The dark gray and black glass pieces mixed with classic white Carrera Marble makes this tile versatile in the bath, kitchen backsplash or on the floors. Thank you for sharing! Such a beautiful tile collection!